A very detailed time scale, offering the advantage of making the single operations clearly visible but, on the other hand only showing a very short period, thus losing the overview. A rough time scale offering a good overview of a longer period, while however affecting the accuracy of details. In our series of Gantt chart tricks we describe how to create advanced planning and scheduling charts with our .NET Gantt control VARCHART XGantt. Read in this blog post how to enhance the time scale function to realize a magnifiying glass letting you keep track of the longer period while at the same time zooming into a selected time window to show every detail of the operations. Step 1) Initial situation: The time scale lies within a planning horizon of several days. The operations circled in red could lead the planner to the assumption that they consist only of three operations. Step 2) To check this, the planner selects these operations with the so called rectangle rubber band. 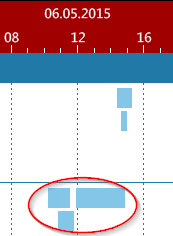 Step 3) Clicking in the white area of the diagram switches off the time scale magnifying glass and the planner sees the former overview again. The labeling of the time scale section DetailedArea has to be more detailed than those of the other two, e.g., markings every ten minutes in contrast to hourly markings for the other time scale sections. Add the data field Tasks:NodeZoomed to your node data table. It will be set at runtime. Do you want to learn how to integrate a shift calendar into timescale? See this blog post.